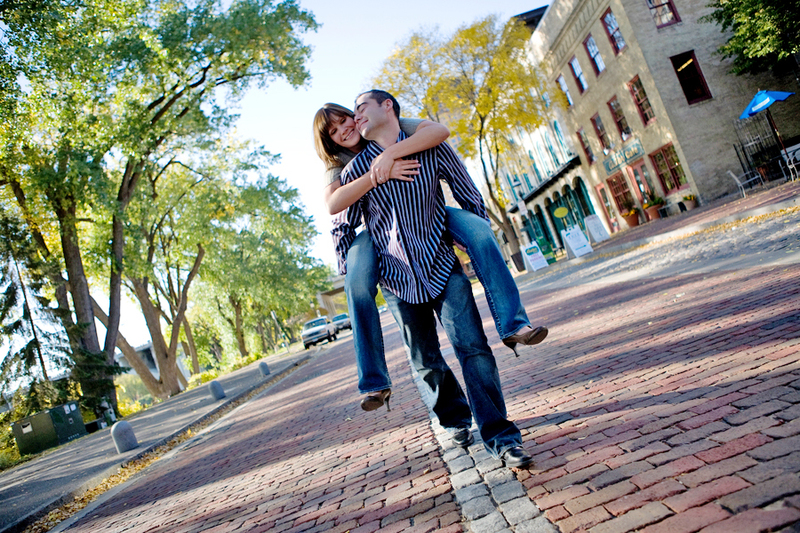 For truly one-of-a-kind shots, try having your Minneapolis engagement photography shoot on the back of a segway. You can choose to take a group tour or rent segways for just you and your honey, then speed off down the historic streets and visit all of your favorite Minneapolis spots. Revisit the location of your first date or your first kiss, or go back to where you first met. Injecting this sort of relationship history into your engagement photos is a special way to make them your own. Pose in front of the city’s gorgeous historic buildings or ride through the skyscraper-lined streets while your photographer snaps some fun candid shots. Your photo session will be fun and exciting, and your excitement will filter through the lens and make all of your images simply stunning. As urban growth continues, the city plays host to all kinds of new and interesting architecture. The new buildings share streets with the historic ones, and the resulting variety is what makes Minneapolis so beautiful. Using your Minneapolis engagement photography session to visit some of the city’s architectural gems is a great way to build an eclectic, urban-centric album. Begin your shoot at the Minneapolis Post Office, a long Art Deco gem that sits along the Mississippi River. The long windows repeating at equal intervals will give you pictures a great geometric backdrop. Pose against the granite and stone façade or against the green lawn that abuts the Mississippi. Walk the five blocks up Marquette Avenue to Rand Tower, another Art Deco masterpiece that shoots 26 stories into the sky. The building’s exterior is characterized by the stacked rectangles that recall 1920’s architecture—probably because the building was built in the late 1920’s. Pose in front of the towering structure and be sure to incorporate the little Deco elements that the architect used, like the gorgeous silvery entrance and hand-carved depictions. These unique artistic elements will add some 20’s era panache to your Minneapolis engagement photography album. Another three blocks up Marquette and a turn on 8th Street will bring you to a contrastingly modern interpretation of the skyscraper. The reflective IDS Center was built in the mid 1970’s and has been copied in many other cities ever since. Play with the light and reflections of the surrounding buildings as you and your engagement photographer get creative with your photo session. Head inside to the awe-inducing Crystal Court, a lobby and shopping area that is encased in glittering glass. The dramatic geometrical elements inside the Crystal Court will translate beautifully to your still shots, and you can also include some of the building’s seasonal décor to add more visual interest. After completing your walkable itinerary, your Minneapolis engagement photography album will pay homage to you and your relationship as well as your favorite urban wonderland. Minneapolis, like many metropolitan areas, has a population so diverse that the city becomes home to a variety of enclaves that represent their residents. Step out into a few of the more popular neighborhoods in Minneapolis; engagement photography is always enhanced by eclectic settings. Begin your photo adventure in Dinkytown near the University of Minnesota. This funky area houses some quaint eateries and small shops with a free-spirited vibe. Have your photographer take some pictures street side to get a small town feel. Don’t leave without posing by the beautiful, historic Dinkydome (formerly a theology school, now a food court), with its columns and stone face that seem out of place in the cutesy neighborhood. End your Minneapolis engagement photography session in the heart of the city, the industrial-styled Warehouse District that starts around the intersection of Hennepin Avenue and Washington Avenue. Formerly the center of shipping and industry, this area is now a spot for those who want to live closer to their work in downtown Minneapolis. The buildings are mostly utilitarian, which can provide strong lines and symmetry for your backdrops that will make for some interesting compositions. Have your photographer follow you as you and your honey browse through some of the neighborhood art galleries or hang out in a trendy coffee shop. By the end of your shoot, your Minneapolis engagement photography album will be filled to the brim with a variety of urban settings that divulge your city’s true nature.